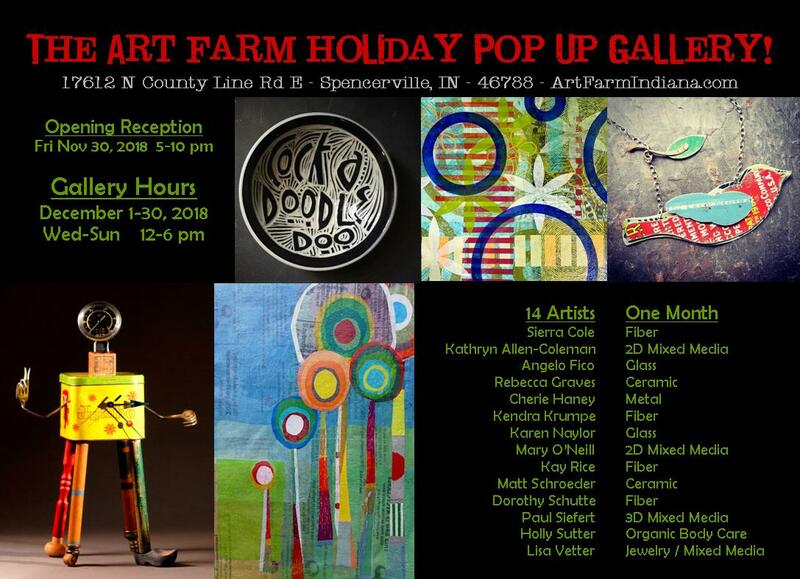 The Art Farm will celebrate their much anticipated annual Holiday Pop uP Gallery with an Opening Reception from 5-10pm! Area artists Lisa Vetter and Paul Siefert turn their rural studio into this holiday gallery event that's not to be missed! This year's event features 14 artists, both local and national. Mediums include ceramics, glass, mixed media, prints, jewelry, fiber, sculpture, and more! We’re excited to present new and unique artists that you won’t find anywhere else in the area. You’re sure to find the perfect gift for every body and every budget! Other than the spring "Rural Studio Tour", this is the only time of year that the Art Farm is open to the public, so don’t miss this chance to support the arts while checking off your gift list! For more information visit www.ArtFarmIndiana.com or join us on Facebook at www.facebook.com/theartfarm.